Even obscure variables such as how frequently a user recharges the phone’s battery, how many incoming text messages they receive, how many miles they travel in a given day or how they enter contacts into their phone — the decision to add last name correlates with creditworthiness — can bear on a decision to extend credit. 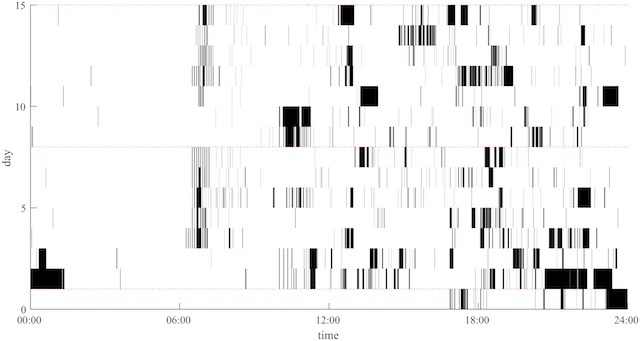 It shows the pattern of one person’s smartphone use over a two-week period, beginning late on a Friday afternoon. Each vertical line represents a single use of the phone, the width of the line showing how long the use extended. The chart comes from a new study on phone use, published in PLOS ONE. Four UK researchers installed a usage-tracking app on the smartphones of twenty-three students and staff members at the University of Lincoln, and then examined the data after two weeks. They discovered that “a simple measure — recording when the phone is in use — can provide a vast array of information about an individual’s daily routine.” Data on phone use, to take a simple example, provides “a non-invasive indication of sleep length.” All but one of the test subjects used their phones as an alarm clock on weekdays, and all of them without exception reported that the last thing they do before going to sleep is to check their phone. Gaps in use during the day are also good indicators of naps. The test subjects used their phones more than five hours a day, on average. Much of that usage went on unconsciously, the researchers found. When the subjects were asked to estimate how often they checked their phone during a day, the average answer was 37 times. The tracking data revealed, however, that the subjects actually used their phones 85 times a day on average, more than twice as often as they thought. “For exploring checking behaviours,” the researchers report, “estimated number of uses show little reliability for measuring actual uses.” We see here how deeply entwined the phone has become with the self — a seamless extension of body, mind, and personality. It is so much a part of us that we are no more conscious of the device moment-to-moment than we are of, say, our hands. If the mere tracking of phone use reveals how we spend our days, our diurnal routines, imagine what would be revealed by a deeper analysis, one that examined the apps we use, the people we connect with, the things we look at and listen to, what we say and what we write and what we like, where we go, what we search for, the photos we take. It’s all there, public self and private self. There’s no shame in admitting the fact: You are your phone. This entry was posted in Media Takes Command on December 1, 2015 by Nick.